See what's making teachers smile! Why be a Sole Source? The materials we have created for Life Skills teachers are from the work in my classroom. Many activities are from some other source that I used and modified years ago. My husband helped to put them in a useable format. Our materials are only for sale from us to you. They are created from our heart in our home and not for sale by anyone else.We are the only source for SpEd Helper, Pictorial Dictionary and the Communication Necklaces that we make. Someday, maybe, we will place them with others to sell but for now they are only available from STAAR-Alt Helper. Our products all came from necessity. Working with Special Education students is hard. All of my planning and making activities had to be done at home. So, when students in my Life Skills class began to be tested with academic tasks, in 2007, it was very hard to understand. In 2009 I began selling STAAR-ALT Helpers to give teachers the materials to do the tasks on the testing. In 2011, when Texas changed to STAAR Alternate testing, I began to make helpers to explain the tasks needed at all levels for teachers. When the test changed, so did I. When we retired, I spent a year putting together SpEd Helper. We have several materials made just for you. We want you to be successful! SpEd Helper is a source of lesson plans and materials for teachers in LID classrooms. The lessons are based on the basic skills needed to meet state objectives and pass standardized tests. They help teachers learn to teach academics to this unique group of students. 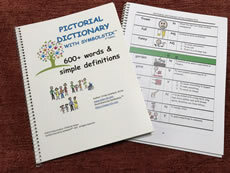 Simple pictorial dictionary with 500 Dolche words and another 100+ anonyms, synonyms and vocabulary! Each word has a symbol, part of speech and simple definition. It can be used with any regular ed activity for inclusion classes. These sets of cards show symbolstix functional symbols. 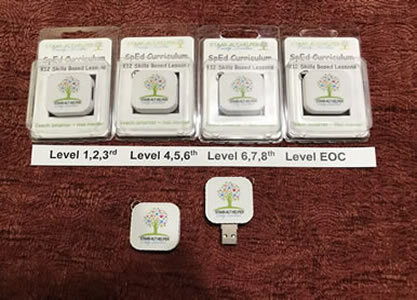 They can be used by all adults at school or in the home to communicate with non-verbal students. With the student and Child sets, students can have a voice at school and home. Instructions for use are included in each set.